I don’t know about you, but Easter always makes me feel renewed. resurrection. Easter affirms and strengthens us like no other season. rest in Christ, but this is one of my favorites. Jericho with sinfulness. 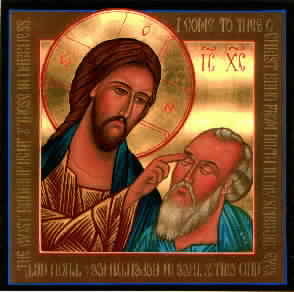 Then we learn that Bartimaeus is blind. then Jesus asks him the central question of his life and of our lives. ways, pick up our cross and follow the Lord. Our faith has healed us. His Cross has redeemed us. Alleluia! Christ is risen! Springtime has finally arrived (we hope!) in north Georgia. The dark rainy days of winter are slowly slipping away into memory and every day sees new blooms in our gardens and the woods around us. A thousand shades of green are blanketing the hills and ridges as sleeping buds burst forth to find the sun. I know how they feel. I’m feeling that same longing for the new life of spring, too. These past few weeks of Lent have prepared us for the true Light of Easter. We’ve been walking to Jerusalem with our Lord, through the good times He’s shared with His friends and now as we will be with Him through His Passion and the Cross of Good Friday. Spring is about changes and new beginnings. And change is painful. The hope of the Cross of Christ is our greatest gift. Through Him, we have the new life we long for–here and for all eternity in heaven. 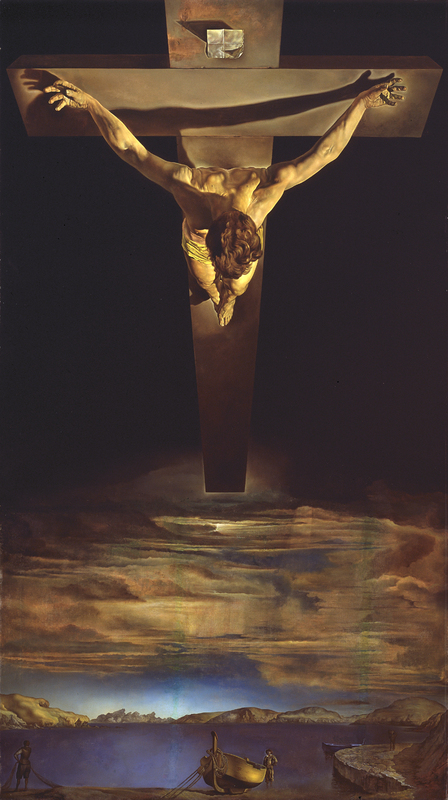 But the joy of the resurrection comes with the exquisite price of Golgotha. Easter is meaningless without Good Friday. In our culture, we often skip anything that smacks of sacrifice or suffering. We want to get straight to joy and happiness. But one look at the life of Jesus shows us how we are to live. And no time in His life is more revealing than this week. He spends time with His friends. He spends time in prayer. He helps those around Him with what they need. He keeps His heart open and His eyes fixed on Friday. He is motivated by one thing and one thing only: love. As we journey towards this Easter Sunday, how well do our lives reflect the hope of Jesus’ gift of the Cross? Like Christ, do we live a life full of prayer and service to others? Are we open to helping those around us when they need help? Does love motivate the decisions we make? If you’re like me, you probably have a ways to to. And that’s exactly when Jesus loves us most—when we still have a ways to go and we choose to make that journey with Him. I believe in the devil. Satan. Lucifer. Beelzebub. The father of lies. Whatever you want to call him—I believe he exists. And not as a theory or a concept but as a real living creature, as real as you and me. After all, The Bible teaches us that the devil is real and was created as an angel (Genesis 3:1-7; 14-15, Isaiah 14; II Corinthians 11:14; Luke 10:18; Matthew 25:44; Revelation 12:4-10). Along with other angels, Satan chose to reject God and was expelled from heaven. Scripture also teaches that the devil and his demons work here on earth encouraging sin and evil (Ephesians 2:1-2). Those who follow Christ have been redeemed by His sacrifice on the Cross. Yet we continue to sin and are engaged in the daily battle to combat our tendency to sin. It’s in this struggle that the devil plays his part. He thrives on sin, on fear, on our doubts and our anger. I know many people no longer believe in the devil. It’s not scientific or modern, I guess. But Jesus Himself was tempted by Satan (Matthew 4:1-11) and I believe he tempts us as well. As St. Paul says, we are in a battle with evil spirits of darkness (Ephesians 6:12). If Jesus and St. Paul know the devil exists, we should too. But we aren’t bound to be the devil’s “victim.” There are things we can do to protect ourselves and our families from his snares and influence. To begin with, your Baptism made you a child of the Father and left an indelible mark on your soul. Simply put, baptism is your “seal of ownership” by Jesus. His grace is within you. Yet our sins after our baptism are proof that we’re constantly vulnerable to going against the will of God. We strengthen the armor of God (Ephesians 6:11) through frequent sacramental confession, going to Mass and receiving Holy Communion. Avoid the trappings of evil like fortune telling, horoscopes, witchcraft, Ouija boards and the like. Don’t invite evil into your home. Pray each day for God to protect us from the snares of the devil. “Deliver us from evil.” Surround yourself with Christian friends who will hold you close in prayer, share fellowship with you and correct you in charity when you need it. Catholics view the Rosary as a particularly effective tool against the devil because it centers our hearts and minds on the life and Passion of Christ through His Blessed Mother’s eyes. We also have sacramentals like holy water, sacred relics, blessed statues and rosaries and, my favorite, the medal of St. Benedict which has been seen for centuries as a very strong defense against the devil. Benedict was born to a noble family in Nursia, Italy in 480 AD. He was well-educated and drawn early on to the religious life. He’s known as the founder of Western Monasticism because he founded many monasteries and wrote the handbook of monastic life, called “The Rule of St. Benedict.” Renowned as a holy man and gifted preacher, he dearly loved and fearlessly proclaimed the Cross of Christ. Many miracles were attributed to him, most centered around his love of and devotion to the Cross. In one instance, a group of monks disliked his strict monastic rule and tried to poison him with tainted bread and wine. When St. Benedict made the Sign of the Cross over the food in blessing, the cup holding the poisoned wine shattered. A raven flew in an open window and snatched up the poisoned bread and flew away with it. To remember his holiness, a St. Benedict medal was struck in 1880 on the 1400th anniversary of his birth. This medal has become one of the most popular religious medals ever made. The face of the medal shows St. Benedict holding a cross and a copy of his monastic rule. Also pictured is the shattered wine cup and the bread-stealing raven. On the reverse of the medal the Cross is dominant along with a Latin prayer: “May the Holy Cross be my Light. May the devil never be my guide.” It’s cooler in Latin because it rhymes. Around the margin of the medal are the first letters of another Latin prayer: “Begone, Satan! Never tempt me with your lies. Everything you offer is evil. Drink that poison yourself!” The medal is itself a prayer of exorcism and of strength in times of temptation. It’s a prayer that the Cross of Christ will protect and guide us and that we reject the charms and lies of Satan. Many people wear the medal (I do) as a constant reminder that our hope is in the Lord. Others place the medal in their homes or businesses and put one in their car. The medal, like other sacramentals, is a visible sign of our faith in Christ. It’s not a magic trinket. 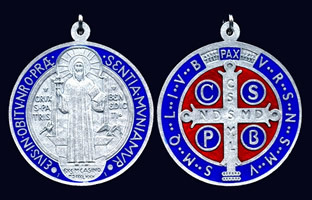 When we wear St. Benedict’s medal we reaffirm our Baptismal promise to reject Satan and all his works. In a world filled with evil and shattered with sin, the Cross remains our true Light, our one Hope, and our everlasting Guide. The medal of St. Benedict is a holy reminder that God’s love and protection always surrounds us. We are held close in our Father’s care. be called out of himself and into a greater purpose for his life. He wants to serve something bigger, something more meaningful. Born in Lucerne, Switzerland, his Catholic faith is important to him. He feels called to serve in the Pontifical Swiss Guards and put his life and his vocation in service of his Pope. We’ll call him Luke. of te Guard’s most famous battles is a great source of pride for Luke. 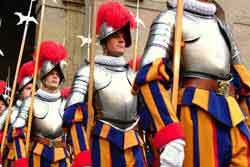 On May 6, 1527 the city of Rome was attacked by Emperor Charles V.
the Holy Father. He hopes to become one of them. and if he’s risen to the rank of corporal, he’ll be free to marry. a tax-free 5000 Euros per month (about $6500), with overtime as well. travels outside the Apostolic Palace. (and for Who) we say we believe? Jesus would found His Church (Matthew 16:18). 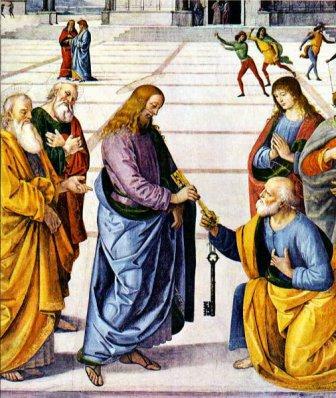 his steward with the keys to his palace and holdings in his absence. Jesus was, by the power of the Holy Spirit (Matthew 16:17). that His Bride will always remain spotless. whoever rejects Me rejects the One Who sent me” (Luke 10:16). with the same power and authority that acted through the Apostles. may change, but the power and authority of the office never changes. of St. Peter emerges as our new pope. Come, Holy Spirit.